As best as culinary historians can tell, the pimento burger was created there (edit Columbia, South Carolina) by Jacob “J. C.” Reynolds, who, around 1954, opened the Dairy Bar on South Main Street in the shadow of the state capitol. Reynolds introduced his signature burger sometime in the 1960s, and it quickly became a favorite of harried bureaucrats and hungover college kids. Reynolds spread homemade pimento cheese directly on the bun before adding a thin beef patty and a layer of chili. Other Columbia lunch spots followed his lead and created their own versions, and for decades the pimento burger ruled as an unheralded but much loved local specialty…. …A proper pimento burger is an exercise in balance and proportion, wider than it is tall, with a thin bun that, at a minimum, has been well-toasted or, better yet, given a sandwich-press squeeze just before serving. The key is to melt the pimento cheese, transforming it into a molten goo that seeps into the beef and the bun, a blissful, unified whole…. I’ve never had a Pimento Cheese Burger. Seen them on T.V., but never actually indulged in one myself. Loving both burgers and pimento cheese, I’ve been curious about trying one for years. After a fellow named Hashmaker on the Big Green Egg forum made one last week and then said to me, “I’d like to see your take on the pimento cheese burger.”, it was bumped to the top of the to-do list. But since I can’t seem to leave things well enough alone, I thought I would “Texafy” it. How should we go about Texafing it? Let’s start with the pimento cheese. I love pimento cheese, so I don’t want to mess with that much. Let’s add some jalapenos! Next, the bun. Hamburger buns are good (it is a hamburger, duh!) Brioche buns? Been done and I can’t find them in my neck of the woods anyway. Think Texas….think local…Telera rolls! These are used to make Mexican tortas, why not my Texafied burger. Hmmm…what else does a burger need? Bacon! Gotta have bacon on a burger. Now we got us the start of a burger. For the pimento cheese, I knew I wanted to go home made on it. Looked at a couple of recipes online, threw some out (no Paula Deen, I don’t need cream cheese in my pimento cheese, thanks) and finally settled on one that was on both the Serious Eats and Savuer websites, but doubled the recipe (I wanted some for sandwiches later in the week) and changed a few things here and there. 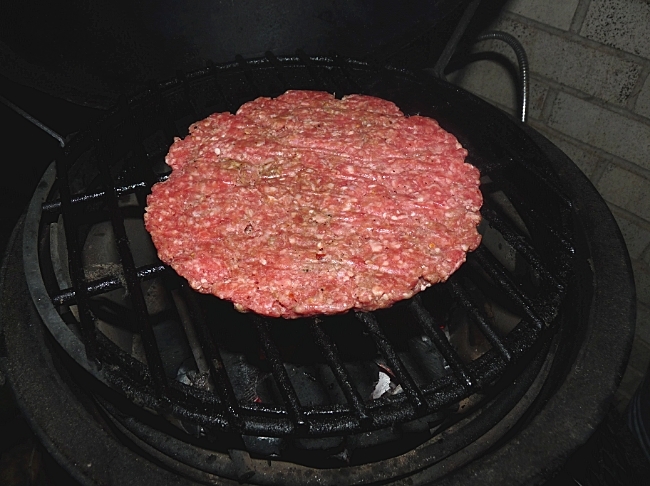 Hamburger patty onto the Mini BGE at 550. 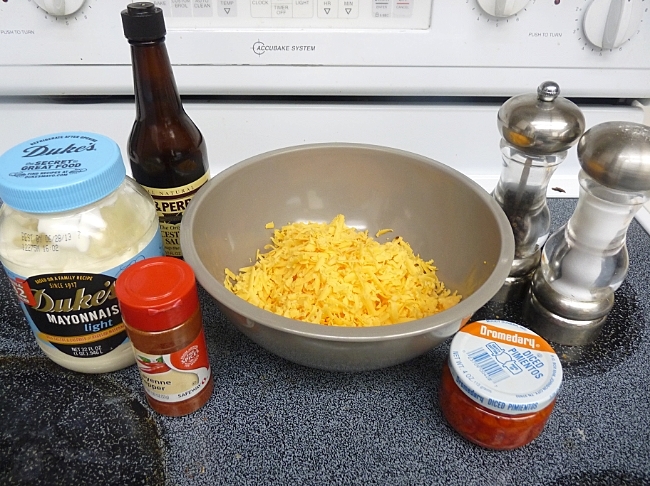 At least 30 minutes before lighting the grill, mix together the ingredients for the pimento cheese in a bowl. Taste and adjust seasoning accordingly. Place pimento cheese in the refrigerator to chill and allow flavors to marry. Combine ingredients for the burgers and shape into 4 thin patties. Place in freezer for a maximum of 30 minutes prior to grilling. Light grill and pre-heat to 550F. Remove patties from freezer and cook for about 4 minutes per side. Flip and top with 2 tablespoons of pimento cheese per patty and continue to cook for another 4 minutes. 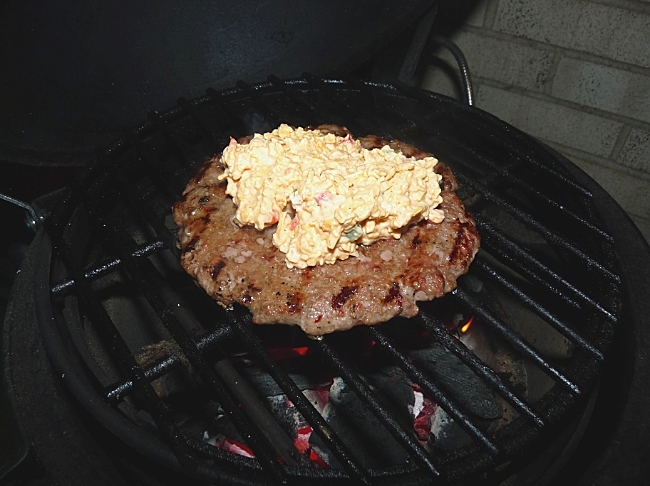 Remove patties from grill when pimento cheese has melted and burgers have reached the desired level of doneness. Top with desired ingredients. One thing I read and was a bit skeptical on (even though it made sense) was that the burger would not need any condiments. If you think about it, the mayo is already in the pimento cheese. If you want to add ketchup or mustard, be my guest, but try it first without them. I was pleased with the flavor and didn’t think additional condiments were necessary. 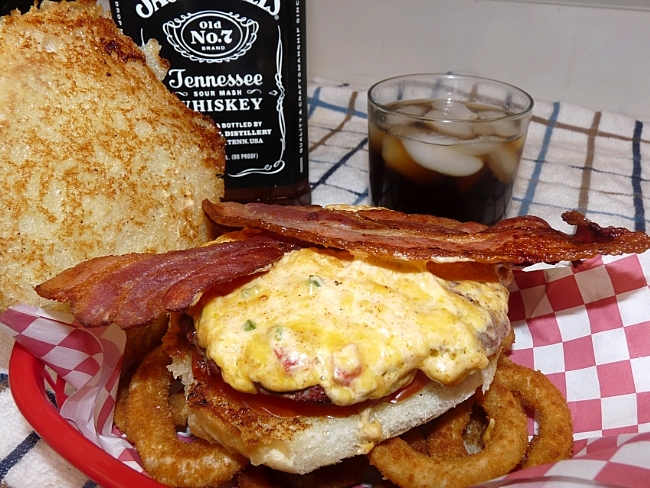 Burger assembled with bacon and served with onion rings. Notice the toasted buns? Gotta have toasted buns with a burger. If you really don’t care about your health, go ahead and toast those buns in the bacon grease. I’m not saying I did that, but I I’ll deny it if you ask. 😉 Look at all those spices in the melted pimento cheese. I may have gone a bit heavy handed there. Ooey, gooey, meltedy cheesey burger!! I had been texting on and off with a BBQ buddy by the name of Dyal_SC through out the night. After two bites, I had to put down the burger to text him and declare I had found my new favorite burger! So good, so decadent. The perfectly melted cheese played nicely with the burger, creamy and delicious, with just a hint of heat from the cayenne and jalapeno. The bacon added the right amount of saltiness and smoked flavor. Like I said before, there was no need for additional condiments. I did put a slice of tomato on the bottom and it complimented it perfectly. Not sure how the lettuce would have worked out. While at the store, I thought I remembered having lettuce. Turns out it had gone bad, so I did without. After trying it, I don’t think it was really necessary. The pimento cheese burger was everything I thought it would be….and more! If you haven’t tried one yet, I highly encourage you to make one. On a side note, I told you I doubled the pimento cheese in order to have extra for sandwiches later on. While the pimento cheese worked perfectly on the burger, standing by itself for a sandwhich…not so much. Maybe the hamburger patty, bacon and bun were enough to mitigate the heat and make it seem not so hot. Maybe overnight the flavors married and intensified. Whatever the case may have been, it was way too hot to eat by itself between two slices of white bread. Really put the burn on. I would suggest either not making enough for leftovers or leave/reduce the amount of jalapenos and cayenne pepper. Other than that, I’m calling this one a success with no need for tinkering. 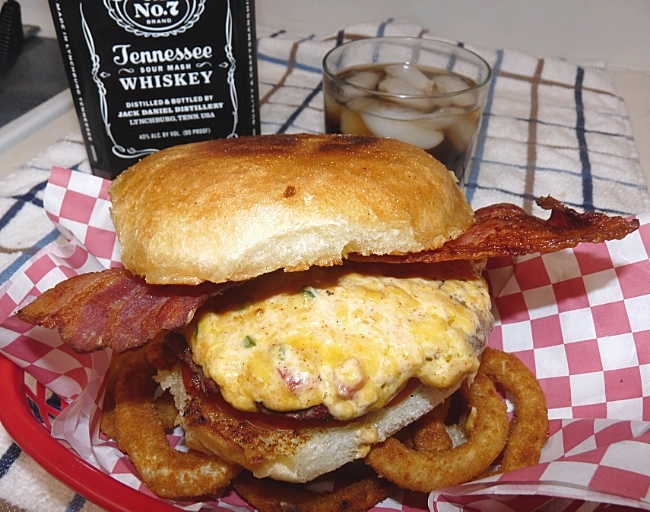 I was recently thinking about making a Pimento cheese burger. My husband loves pimento cheese. 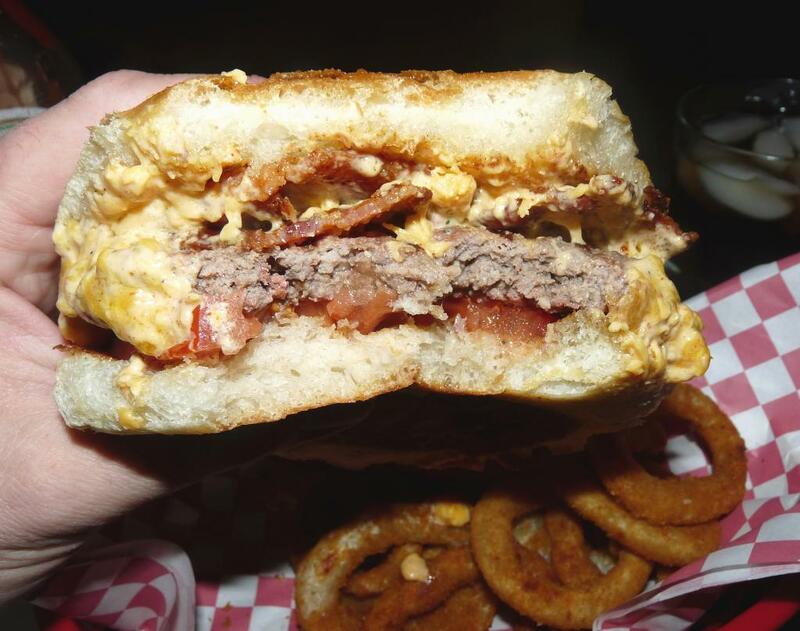 Your burger looks really ooey and gooey and delicious. YOu should really try one. Like the new design. Reminds me of table cloths in the country at farms and ranches and such. One bite and I think you would. Its basically just cheddar cheese and mayo anyway, but up a notch. Wow! This is awesome! Love the use of the Duke’s, good cheese, and your not adding sugar. Very Southern of you. I can’t wait to make this. I wanted to just grab it from the screen! Your “day after” results made us laugh and recall our worst pimento cheese ever. Two years ago, I had smoked some great cheeses included a white and a sharp cheddar. I thought that would make a great pimento cheese so made it up. The next day tasted it for lunch and sweet mother of pearl, it was AWFUL. The smoke flavors had intensified overnight making it inedible. The cheeses themselves were excellent but that pimento cheese was the devil. I haven’t gotten into smoking cheeses yet. From what I have read is that you need to let them mellow for a bit in the fridge. Have you ever tried it again, Chris? Ah… wow. I’m a little lost for words. As an Australian, your pictures kinda remind me a bit of ‘Epic Meal Time’… juicy, delicious, meaty and completely fat-and-carb-overloaded in the most tempting of ways! I’ve never been to Texas but your blog definitely takes me there with a whack of generous hospitality. Love it, can’t wait to browse through your archives! Thank you so much. I used to watch Epic Meal Time religiously. Every Tuesday (I think) when they would have a new episode. Quit watching after awhile as it just got a bit ridiculous. Glad you found my site and I hope you like it. That is one awesome looking burger! I love the before and after shots of the cheese. And some beautiful onion rings. They look better than what a lot of restaurants offer!